Refried beans made in a crock pot. Lots of flavor and no fat! 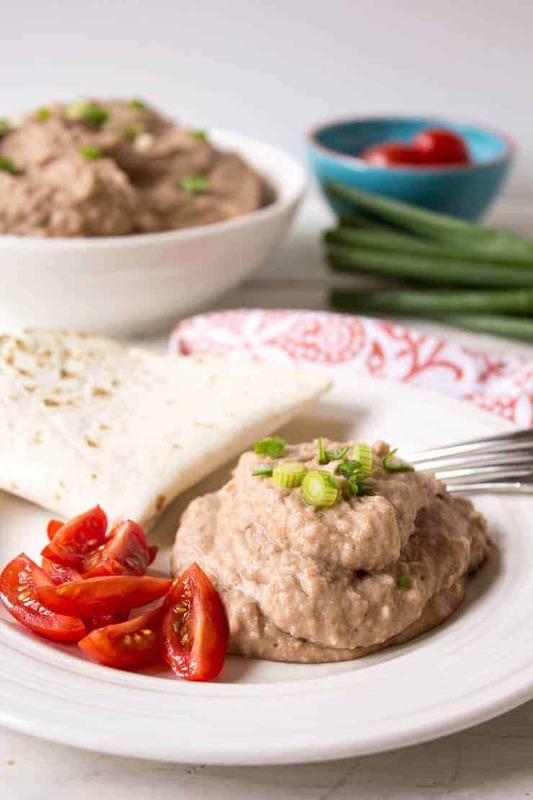 I love, love, love these crock pot refried beans! They are so tasty….so easy…. and they aren’t from a can! 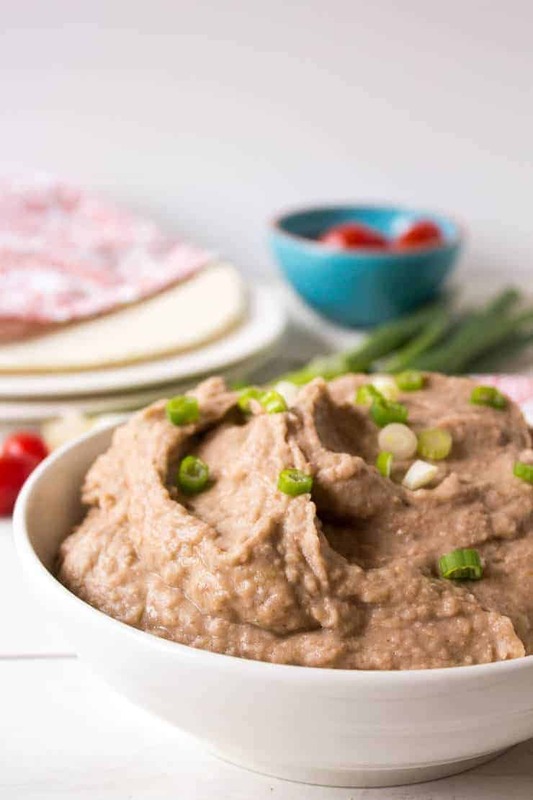 Canned refried beans don’t have a lot of extra or strange ingredients in them, but anytime I make something myself, I just know exactly how it has been handled and the quality of the ingredients I use. Plus homemade refried beans are much cheaper than buying the cans from the grocery store. I’ve made these refried beans several times and I think I’ve finally nailed the technique. Even though these are called refried beans, they aren’t really refried. I know traditionally that is how they got their name, but not necessary here. Once the beans are cook through, you have them mash them up! Lots of fun, right? Since we also need to keep the onion, garlic, and peppers in the beans, pureeing the mixture actually works better. I’ve used all types of modern conveniences: an immersion blender, regular blender, and a food processor. The blenders work well, but my biggest problem is too much liquid. And too much liquid = runny beans. Now I don’t like my beans as thick as they come out of the can, but I would like them hold their shape on a chip or not run straight out of a burrito. The food processor has become my best friend for these beans. I simply scoop the beans, onions, garlic and peppers out of the crock pot with a slotted spoon and pile it into the food processor. A bit of the liquid gets transferred with each spoonful. Then simply pulse until blended! If it is too dry you can scoop a bit more liquid. I do this in several batches and then place huge bowl. It is okay to leave a few beans whole or just partially mashed. Once they are all mashed up, I add salt and then divvy up the beans into small containers and throw them in the freezer for weeknight dinners. When I make these, I usually make the biggest batch that will fit into my crock pot. For me, that’s a two pound package of pinto beans. My recipe below is for one pound of pinto beans. Not everyone has a huge crock pot. Another dried bean recipe to try is Instant Pot Black Beans. Refried beans made in the crock pot. 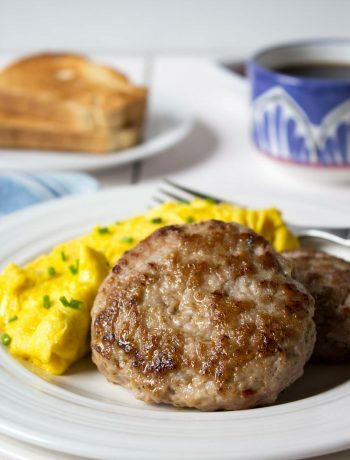 Can be portioned and frozen for quick dinners. Put beans in a crock pot. Cover with water. Water level should be about 3 inches above top of beans. Add onion, garlic, and peppers. Cook on high for 6 hours until beans are cooked through. Using a slotted spoon, transfer mixture to a food processor. Pulse until smooth. You will need to do several batches of this step. Recipe can be doubled, depending on size of crock pot. Anaheim peppers can be substituted for jalapenos. If you like spicier beans, leave seeds in peppers. Hey, I made these and they were pretty good! they really did have that refried bean taste without being fried (obviously). I ate them throughout the week. I’m probably making them again this weekend. Wonderful! I’m so glad you like them! 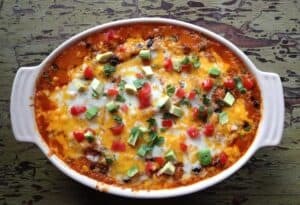 I make them often…we seem to eat a lot of refried beans! I never thought of making my own refried beans. I love that it’s a crock pot deal with no worries about an overnight soak. Can’t wait to try them. We all love refried beans in this house! 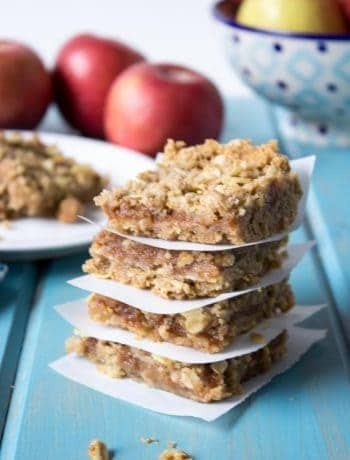 They are easy and very delicious! I hope you give them a try! It’s not too late to give them a try! 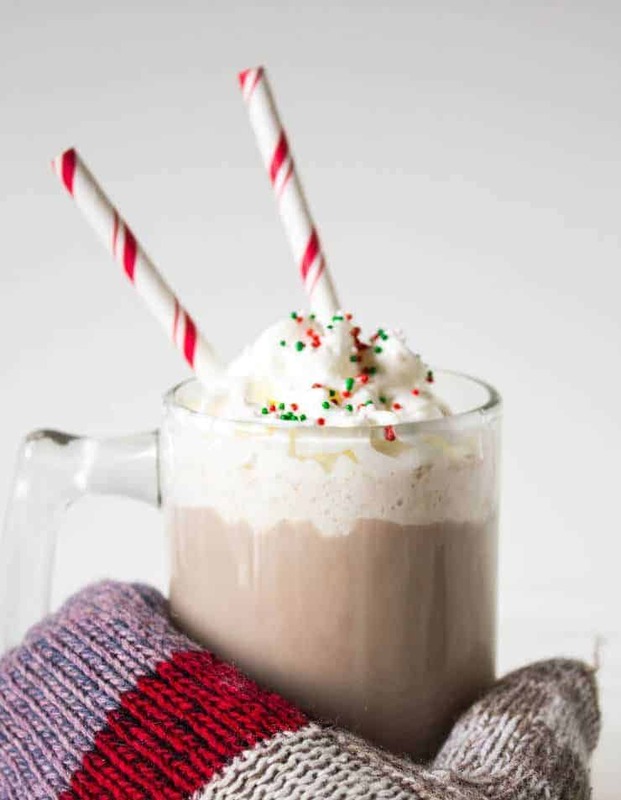 They are super easy to make! 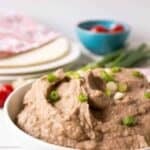 That’s such a smart idea to make refried beans in the crockpot! 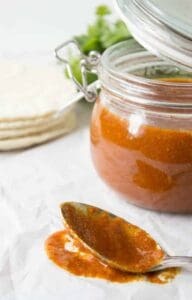 And considering we eat mexican all the time I should totally make these! 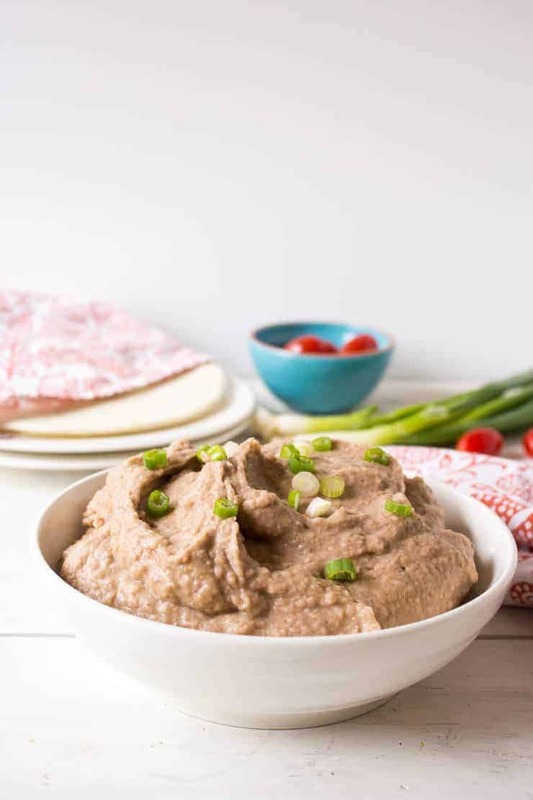 Oh wow – I can imagine the flavor of homemade refried beans…my family will love them! Especially with the added jalapeno! You can always add a couple extra jalapenos if you like a little more heat! 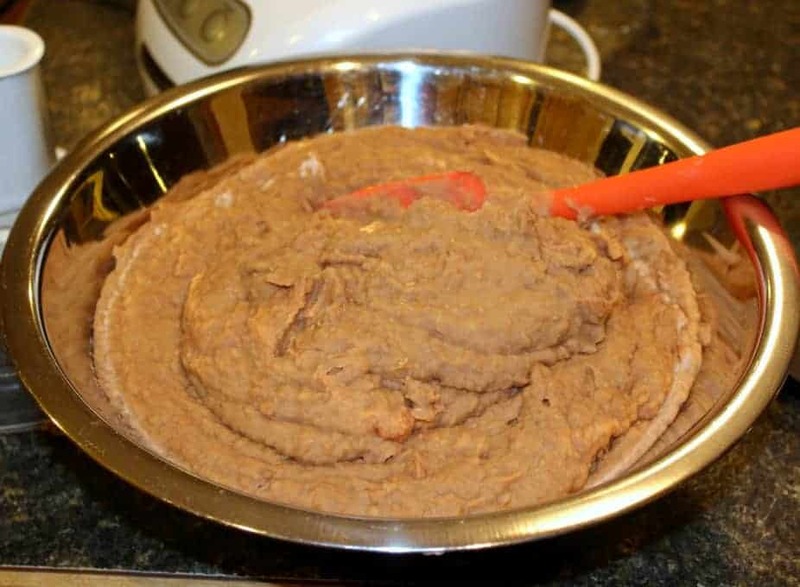 I never tried making refried beans myself, but I can only imagine how tasty they are! Homemade things are always so much better than canned, and healthier too! Looks delicious! Crock pots are amazing…I don’t use mine nearly enough! My grandma used to make something similar in Romania, with white beans, paprika instead of jalapeno and lots of raw onions on top. I know just how delicious this is. 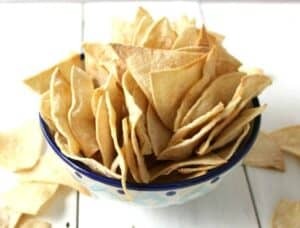 And I love those chips as well, I would love to try this combination. I think it is fascinating that every culture has their own dish that is so similar to other cultures. They are definitely a staple in our house. 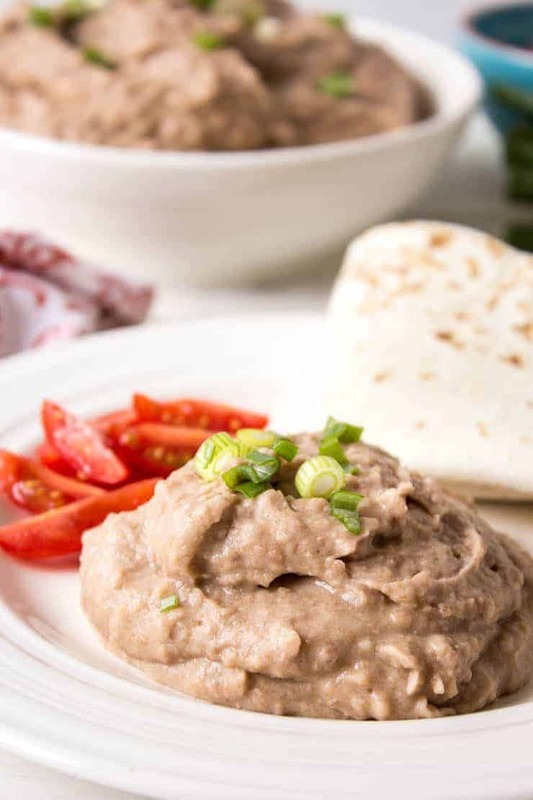 I could eat refried bean at every meal, so crock pot refried beans sounds all sorts of amazing to me! With the convenience of the crock pot, I really CAN eat them at every meal…. which might be a dangerous thing. 😉 Can’t wait to try these! Cheers! I was never any good with remembering to soak my beans overnight, so these beans are perfect for me. Just throw everything in the pot when you’re ready! I like that you make the biggest batch that fits in your crockpot! fantastic! I am the only one I know who likes refried beans. I don’t get it. they’re amazing! My favorite thing to do is make a batch of refried beans, then smear it on a pizza crust to make my favorite taco pizza. I will definitely have to try this! On pizza! I haven’t tried that! Time to make another batch of beans…gotta try it on taco pizza!